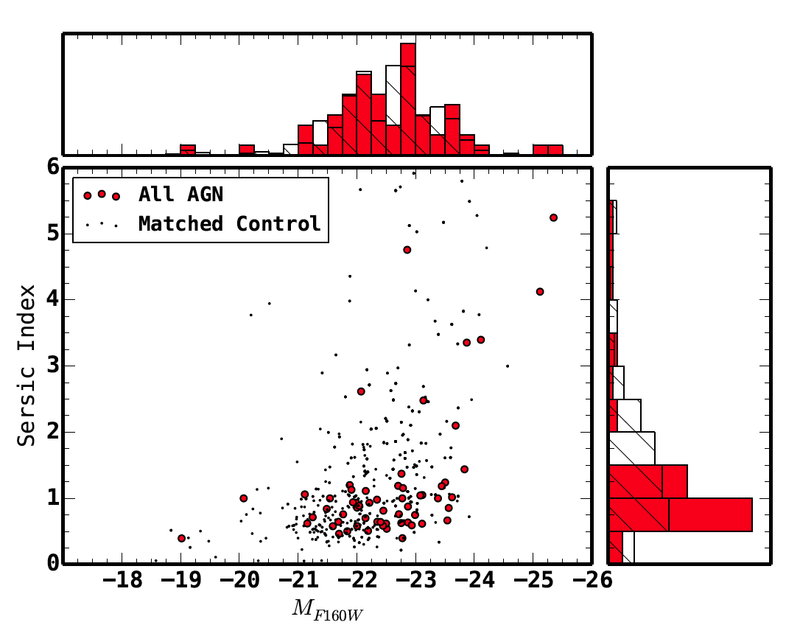 Do major mergers trigger luminous AGN? Authors: C. Villforth, F. Hamann et al. Astronomers now believe that all galaxies contain a black hole at their centre and the bigger the galaxy, the bigger the black hole. However, not all of these black holes are what astronomer’s call active. Active black holes are accreting galactic matter; they feed on it before throwing it back out in hugely energetic jets. Only a small fraction of black holes show strong signs of accretion causing their host galaxies to be dubbed as objects with Active Galactic Nuclei. The question still remains of why is this the case? What conditions are necessary in order for a black hole to become active? We know that accretion requires two things (i) available gas or stars (i.e. fuel) to feed the black hole and (ii) a process to strip this feeding material of its angular momentum. Many processes fulfilling these criteria have been proposed as possibilities in the past including: close passes between galaxies which disturb their gravitational potentials, mass loss from stellar winds, disc instabilities, accretion from the galactic halo and major or minor mergers of galaxies. These are all classed as violent galaxy evolution processes, as opposed to processed dominated by secular evolution, which lead to more subtle changes in a galaxy. Observations of AGN have shown a vast range of luminosities in X-ray, radio and infrared bands, suggesting that this range also requires great differences in the amount of accreted material needed to fuel the black hole at the centre. High luminosity AGN require more accreted material to produce their observed luminosity, suggesting that the process which triggers this accretion is a lot more galaxy-shaking than those that produce the lowest luminosity AGN. A major galaxy merger is the only disturbance to a galaxy which is thought could produce such high luminosity AGN. You can see the theoretical appeal, however the observational evidence for a correlation between mergers and high luminosity AGN are few and far between, as well as extremely contradictory. In this recent paper, the authors try to address this question once more by testing the hypothesis that mergers dominate the triggering mechanisms in very luminous AGN (and at which luminosity they become the dominant mechanism). They test this by using morphological measures of how the shape of the AGN host galaxies are disturbed and compare this to a control sample of inactive galaxies. By performing statistical tests (e.g. KS and MW tests) on the distributions of these two samples they can determine whether they are drawn from the same overarching population. If this is the case, then there is no evidence for high luminosity AGN having more likely to have undergone a merger than the control sample. These comparisons are shown below for the Sersic index (how bulge or disc dominated a galaxy is) and the asymmetry (A) of the control and AGN samples of galaxies plotted against the magnitude of each galaxy measured in the F160W/H band from the GOODS-South survey (corresponding to a restframe wavelength of λ ~950mm). 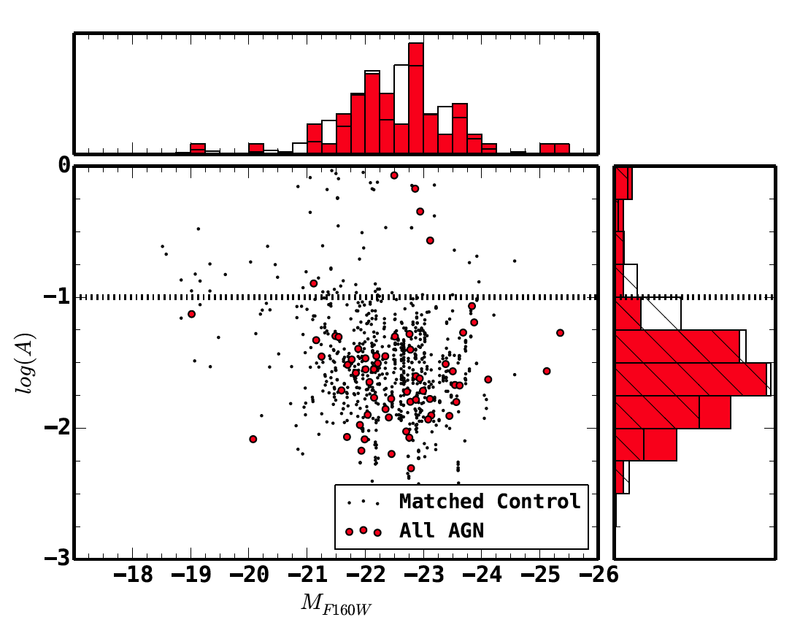 No significant statistical difference is found between the AGN and control samples of galaxies in the above cases. The paper also provides an extensive table of the total 28 statistical tests they perform on the data for varying morphological parameters. In all cases they fail to reject the null hypothesis that the two samples are drawn from the same parent population. Or in other words, the host galaxies of the AGN show no strong morphological differences to the control galaxies and so we cannot infer that the AGN host galaxies have undergone a recent merger to trigger their highly luminous activity. that the delay between the triggering process and the apparent AGN activity is too long for merger features to remain in the morphology of the galaxy. Further study will be required in order to determine which of these scenario’s is the case. One thing that is for certain though, is that the debate still rages over the dominant triggering mechanism for AGN activity and this paper has managed to provide fuel for both sides of the fire. Thank you Becky for the very nice write-up of the paper!